Statelawyers.com offers an extremely easy, effective, and affordable way for attorneys to advertise on the Internet. As an attorney, you realize the importance of promoting your practice. People are using the Internet to search for and find the right lawyer every day of the week, all across the country. 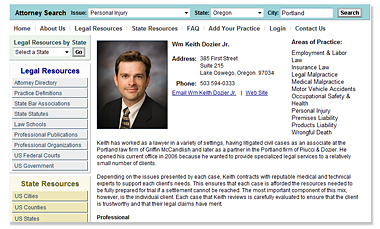 StateLawyers.com specializes in bringing these individuals to attorneys - like you. 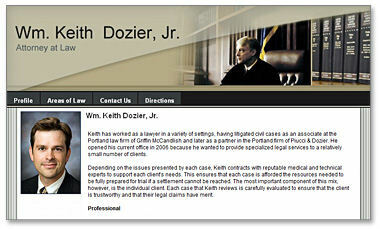 We provide you with an affordable Web site and drive future clients to your site, through our Attorney Directory. We're so confident you'll be satisfied, we want you to use our services FREE for the first 30 days. Subscribing is easy and only takes a few minutes. • Only $25 a month, no contract, and cancel at anytime. • 30 Day, No Obligation, Risk-Free Trial. • List yourself in up to 10 areas of law. • List yourself in Every Community, in up to 6 Counties. • List yourself in multiple States. • Over 6 million hits, on our Web site, per month. • StateLawyers.com has achieved a Google Page Rank of 6. • Prominent positioning on all major search engines. • Manage your Listing through your secure Control Panel. • Complete professional Website. Setup only takes minutes. • 5 Email accounts per site. • Use your own domain for Website and email. • Makes changes anytime through easy to use interface. • No technical or programming skills needed. • Create your own Custom Pages. • Many professional designs to choose from. select Billing, check the button labeled Cancel and we part friends. And remember, the first month is always FREE.